(17/P37) TRENTON – The New Jersey Forest Service, within the Department of Environmental Protection, today joined Camden officials and the New Jersey Tree Foundation to celebrate Arbor Day with tree plantings at the Camden Day Nursery School and an annual awards recognition ceremony near the historic Walt Whitman House. 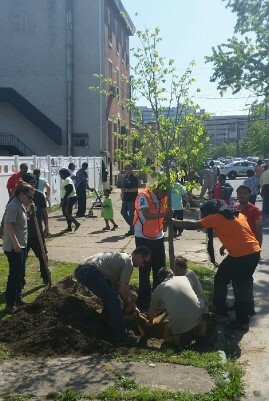 Camden was chosen to host this year’s Arbor Day celebration because the city is marking its 15th anniversary of participation in the New Jersey Tree Foundation’s Urban Airshed Reforestation Program (UARP), which benefits urban and community forestry. The UARP is a community-based tree-planting program that began in Camden in 2002 and is expanding to serve additional South Jersey cities. Designed to improve air quality, manage stormwater and provide shade, the UARP has removed approximately 87,000 square feet of impervious surface to plant 6,296 trees along city streets, 220 of which were planted last fall. Prioritizing grassroots work, the UARP empowers residents to create positive changes in their communities. Residents apply for and adopt trees, help organize events, and assist with the planting of each tree. To date, the UARP has engaged approximately 12,709 volunteers to beautify South Jersey’s cities. 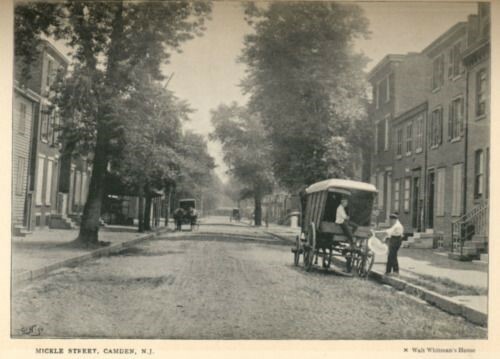 Camden also has established its own Shade Tree Advisory Board, the city’s second five-year Community Forestry Management Plan (CFMP) was recently approved and extended until 2020, and residents and employees have earned more than 580 continuing education credits and almost $30,000 in grants from the New Jersey Urban and Community Forestry Program (NJUCFP) for CFMP development and implementation. Camden has been a Tree City USA for six years. To commemorate Arbor Day, trees – two Ulmus Americana ‘Princeton,’ four Tilia cordata, and three Syringa reticulate -- were planted in enhanced tree pits in the streetscape around the school. The planting was designed by the Rutgers Cooperative Extension Water Resources Program as part of an ongoing effort to mitigate stormwater throughout the city. An enhanced tree pit collects rainwater by diverting runoff from the sidewalk or street. Enhanced tree pits are specially engineered with amended soils, plants and trees to absorb water and filter pollutants. In 1949, the New Jersey State Legislature officially designated the last Friday in April as Arbor Day to honor trees and the people who take care of them. New Jersey has a great diversity of tree species, which has helped grow the state’s forests as well as add to the lush landscapes statewide. During today’s ceremony, the DEP presented the prestigious Joyce Kilmer Award for outstanding contributions to community forests to Sheila Roberts of the Cooper Landing Civic Association and the Camden Shade Tree Advisory Board, and Benigno Rodriguez of the Camden Block Supporters Initiative. In addition, awards were presented to 12 municipalities for their participation in the 2016 Arbor Day Foundation’s Tree City USA program. The NJUCF has released its 2017 round of Community Stewardship Incentive Program (CSIP) grants for local governments accredited with the program. More than $1.8 million is available for resiliency planning and reforestation, and tree planting. The grants can be used to help conduct urban and community forest inventories, and to develop plans to mitigate damages caused by emerald ash borer. The NJUCF encourages and supports the stewardship and effective management of trees and forest ecosystems in New Jersey’s communities through accreditation, technical assistance and financial assistance. Funding for this year’s CSIP grants is made possible by the Treasure Our Trees license plate and the No Net Loss reforestation program. Earlier this month, the DEP began distributing 112,500 free tree seedlings to state residents in 128 municipalities through an ongoing partnership among the New Jersey Tree Recovery Campaign, State Forest Service and the non-profit Arbor Day Foundation. To learn more about the NJUCFP, 2017 CSIP grants and accreditation, visit: www.communityforestry.nj.gov and subscribe to the listserv.